It looks as if this is going to be a largely snow-free winter. Dipping into Great Storms of the Chesapeake, I thought I would cool things down with a lead in to the storm that buried the Chesapeake Bay region more than a century ago. Best enjoyed with a cup of hot cocoa in hand! 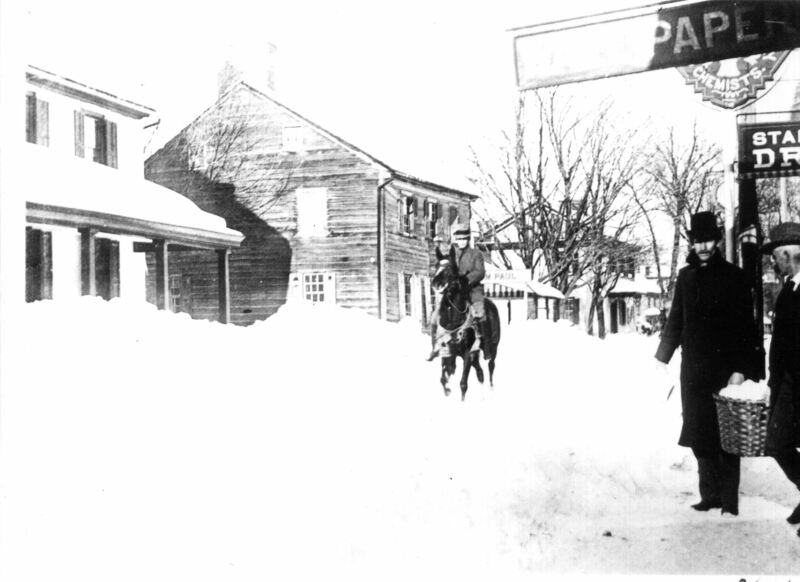 With roads clogged, a horse remained a good form of transportation during the blizzard of 1899. COURTESY HISTORICAL SOCIETY OF CECIL COUNTY. 1899. William McKinley was president. He would be the last Civil War veteran to serve in the White House. The Spanish-American War had just ended, and at least one Marylander, John A. Kay from the quiet Cecil County town of Rising Sun, was among the 250 men who died in the explosion aboard the USS Maine. Teddy Roosevelt and his Rough Riders had exacted revenge. It was the year the paper clip was invented and the Bronx Zoo opened. The first automobile fatality in the world occurred. The historian Bruce Catton was born, as were dancer Fred Astaire and writer Vladimir Nabokov. In Baltimore, a young reporter named H.L. Mencken was just getting started in the newspaper business. He would soon find himself trekking through huge snowdrifts to work on his first story. Everywhere one looked, there was a Maryland that was racing toward the modern age and that seemed to be bursting at the seams to enter the 20th century. And yet, there was much about the Chesapeake Bay region we take for granted today that was still far in the future in 1899. It was true that Marylanders had one foot in the new century, the the other foot was very much in the 19th. First and foremost was the fact that the age of the automobile had not yet arrived. Traveling to another town meant hitching up the horse and buggy, or else walking. At the same time, the railroad system was highly developed. Tracks reached to almost every town of consequence. Since the 1860s, for instance, the residents of the town of North East on the upper Chesapeake Bay could catch one of several trains that ran each day to Baltimore and Philadelphia. Train service was fast and reliable, not to mention affordable, and these trains gave Marylanders a great deal of mobility and prosperity. The other important mode of transportation, especially for those who lived around the Chesapeake Bay, remained the steamship. It was still the Age of Steam, and travelers depended on services such as the Ericcson Steamship Line. Traveling around the bay was fast and efficient by steamship, considering that the Chesapeake Bay Bridge wouldn’t be built for another 50 years. Communication was almost as instantaneous as it is today. Telegraph lines stretched to the smallest villages. Alexander Graham Bell had received a patent for the telephone in 1876, and telephones were already beginning to arrive in middle class homes. As they had since colonial times, the people of Chesapeake Bay continued to make their living off the water. And in 1899, that meant oystering. The supply of oysters still seemed endless, and thousands of men worked to pluck as many as possible from the bay’s great oyster reefs. The harvested oysters were canned or shipped fresh by train to Philadelphia and New York. These oystermen, so desperate to make as much as they could during the short oystering season, would suffer terribly during the storm. Several others would be lost in the blizzard. While the month had started with seasonable temperatures of 27 degrees Feb. 5-7, the weather had turned viciously cold when a great arctic air mass rolled down and hovered over the mid-Atlantic. In the days before the storm, the temperatures almost seem unreal today: Charlotte Hall hit minus 19. Fallston in Harford County was minus 14. Out in Carroll County, the temperature fell to minus 23 degrees. On Feb. 10 the thermometer dipped to minus 10 in downtown Baltimore. That was the air temperature … what the wind chill must have felt like is chilling, indeed. It goes without saying that the ground froze solid, as did much of the Chesapeake Bay. In temperatures that savage, keeping warm and covered up became a matter of survival for so many of the men and women forced to work outdoors or on the water. In Ocean City, the surf froze on the beach and left the life-saving station there stranded and its crew under “great personal privation.” The Susquehanna River ice was 14 inches thick at Havre de Grace. The Potomac froze over. Tangier and Pocomoke sounds were closed to vessels. Chesapeake Bay froze all the way to its northernmost reaches. The cold would have been bad enough. But then came the snow. This entry was posted in Delmarva History and tagged Blizzard of 1899, Cecil County, Great Storms of the Chesapeake. Bookmark the permalink. In January 1958,while a Freshman at Lycoming College,Williamsport,Pa, temps never rose above zero all month. Car batteries froze and the Susquehanna froze solid. I remember when the thaw finally came,there were ice flows 2 ft thick. The winters inthe late 60s and ear;y 70s were bad for the bay-ice boat races were held on the Miles River. Waterman used chain saws in Knapps Narrows to cut hole in the ice to be able to tong for oysters. Sam, thanks for sharing that. On the news the other day, I saw video of Germans using cordless saws to cut small boats free of frozen rivers. They are having the real winter that we didn’t get this year!